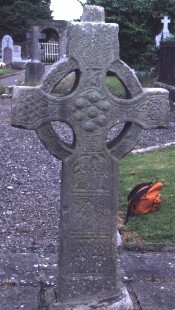 This sandstone cross is situated in a cemetery at the North of the Protestant Church at Duleek. Its measurements are 1.82 high x 97 cm arms span, the shaft is 37 cm wide by 21 cm. It is mounted on a (visible) base 50 c m x 45 cm. Each panel is framed by a roll moulding.